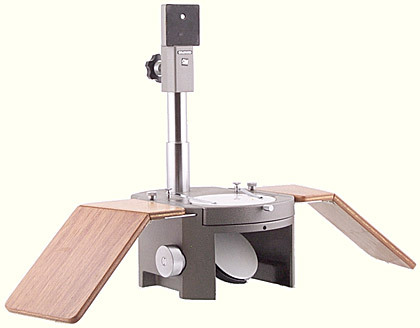 A heavy, rigid stand similar to ones that Olympus has been using for some of its stereo microscopes since the 1970s. Supplied with a reversible opaque stage glass (black on one side and white on the other), and a pair of stage clips. The height of the column is only 124 mm, but this can be increased by 74 mm by removing the screw-in cap from the top and replacing it with the Macrophoto Stand Extension Bar VST-E. Only one Extension Bar can be fitted, because it is only threaded at one end. The Macrophoto Stand B Adapter, not supplied with the Stand, is required in order to provide a ¼″ screw fitting for attaching either the Auto Bellows or the Focusing Rail. The supplied stage glass is interchangeable with a range of other stage plates for various methods of illumination. The Stand can be used on the Trans-Illuminator Base X-DE with subjects that need to be viewed by transmitted light. This arrangement is also used in conjunction with the Lieberkühn reflectors. Instructions were not provided with the VST-1. A compact and sturdy multi-purpose stand for solid-camera support in close-up and macrophoto work. This stand consists of three seperate available units. The base unit is the Macrophoto Stand VST-1, which comes with frosted stage glass for incident light and may be used in conjunction with the Trans-illuminator Base X-DE for lighting of transparent subjects from beneath. The Macro Photo Stand B Adapter is designed for mounting the camera, the Auto Bellows or the Focusing Rail to the Macrophoto Stand VST-1. The Macrophoto Stand Extension Bar VST-E extends the height of the Macrophoto Stand VST-1 for longer subject distances, for instance when a standard lens or the 135mm Macro Lens is used. This unit fits seamless in the Trans-illuminator Base X-DE for transmitted lighting. Five separate exchangeable Stage Plates and Stage Glasses are available for various lighting techniques. The Mechanical Stage FM enables pin pointing of the subject for high magnification work. 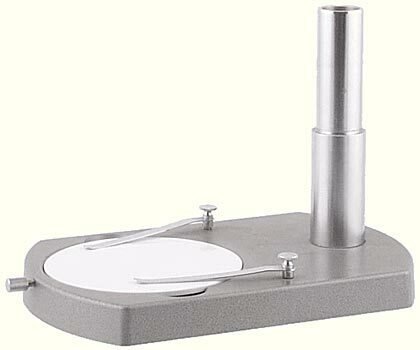 The Varimagnifinder is recommended for comfortable operation when the Macrophoto Stand is placed on a table. A Motor Drive or Winder and M.Remote Cord are recommended to avoid camera position shift when winding the film.